BREAD: A good quality white (baked by Blackbird). 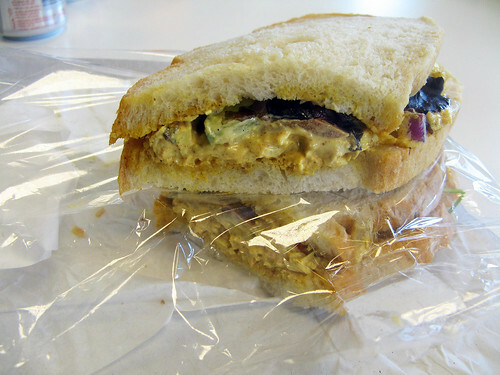 FILLING: Chicken mixed with madras curry mayo, lettuce, sliced tomato and finely diced red onion. PROS: This is basically coronation chicken in disguise but my goodness, it’s delicious. The large, juicy chunks of chicken are plentiful, bound in a borderline indecent amount of curried mayo. Although this is made with a curry powder blend, it miraculously swerves any danger of tasting like something one might find chilling in a motorway service station and instead plants itself firmly in the camp of luxurious; silky soft and dreamy. The sweet little nubs of red onion are the perfect garnish too, adding just the right amount of allium bite. For £3.50, it’s extremely good value, because this sandwich is an absolute giant. At the halfway point I almost considered saving the other half for later. I didn’t, of course. Blackbird are trying to revive a British classic and are doing so with style and taste. CONS: The insipid tomato needs to go. Also, the second time I bought it there was no red onion, which upset me a lot; I’ll mention it next time I go in. Speaking of return visits, I almost didn’t make one after a particularly irritating morning about 6 months ago when I popped in to pick up a sandwich on my way to work. I asked if there were any sandwiches available and the lady there told me that no, they don’t make them until 10am. “Oh, you don’t have the ingredients yet?” I asked her. “Oh yes, we just don’t make them yet” she replied. That’s fine, but I took a quick look around, and considered the fact that there was only one other person in the cafe and two members of staff. I then asked very nicely if they’d mind putting one together, a request which was met with a flat ‘no’ delivered in what was, frankly, a truly arsey tone. Is it really too much trouble to make a sandwich when you’re not doing anything else and I’m a regular customer? Really? Hacked me off for months, that did. Anyway, the sandwiches are good so I return. Sigh.